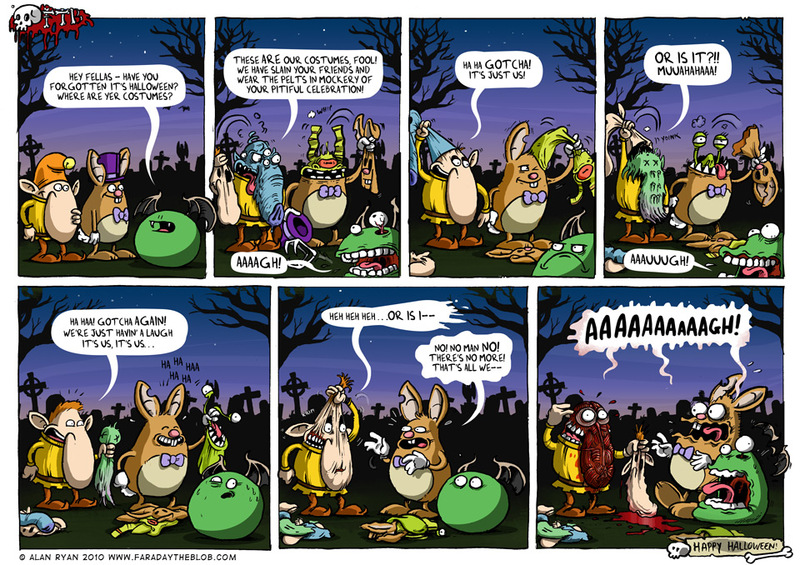 This entry was posted on Saturday, October 30th, 2010 at 2:43 am and is filed under Comics. You can follow any responses to this entry through the RSS 2.0 feed. You can skip to the end and leave a response. Pinging is currently not allowed. I have a really funny comment about facelifts but… NAAAH… It’s over your heads. WEll now someone else has a costume to wear. @Bearman – Well he could always try putting it back on… bit of sellotape maybe? Love the comic. Just found it today, and have gone through the archives. You, sir, are awesome. Xaos – Hey thanks – Glad you like it! Damn, that is a meaty nose. But do I detect a little Pete Bagge homage going on? I think the big nose comes from challenging myself to draw characters with ever larger noses as a budding cartoonist. The primary culprit for sending me down that particular path was probably Jeremy Banx who drew for ‘Oink!’ comic. That man drew a quality nose.